Geoprobe Transport VIMS professor Christopher Hein transports his Geoprobe drill rig to sample barrier-island sediments along Virginia’s seaside Eastern Shore. Barrier islands make a great location for a spaceport—think Cape Canaveral and Wallops Island—because rockets can launch over water, minimizing hazards to people and infrastructure. But that seaside location comes with a cost—barrier islands are among the most ephemeral of landscapes, changing shape and size with tides, currents, storms, sediment supply, and today’s rising seas. Now, a team of researchers including Dr. Christopher Hein of William & Mary’s Virginia Institute of Marine Science is joining forces to demonstrate how new coastal-mapping technologies can help better understand and sustain NASA’s Flight Facility and Virginia’s Mid-Atlantic Regional Spaceport on Wallops Island. Project partners include Dr. Art Trembanis of the University of Delaware and Dr. Michael Fenster of Randolph-Macon College, with seed funding from Virginia’s Center for Innovative Technology. On Friday, September 22nd, the team will meet with Virginia Governor Terry McAuliffe, Secretary of Technology Karen Jackson, and other state and federal dignitaries on Wallops Island to demonstrate technologies available for studying the complex above- and below-ground dynamics of barrier-island systems. The technologies include side-scan sonar, autonomous underwater and aerial vehicles, an autonomous kayak, ground-penetrating radar, a seismic-reflection profiler, and mobile coring rigs. The demonstration will be hosted by the Mid-Atlantic Coastal Resilience Institute. Established in 2014, this multi-state partnership brings climate-change research to bear in helping local and regional leaders make coastal communities and habitats more resilient. "Barrier-island dynamics are of growing interest to land managers of coastal states and counties given observed and forecasted accelerations in sea-level rise and increases in coastal-storm intensity," says Fenster, a coastal geologist with previous experience in Wallops’ Shoreline Restoration and Infrastructure Protection Program. "Our effort will provide the best science available to make this area resilient, taking into account all stakeholder interests." “Our demonstration will showcase how we can use state-of-the-art research instruments to collect data from air, land, and sea,” says Hein, who has studied barrier-island systems from New England to Brazil. 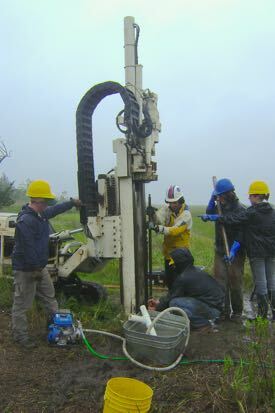 He will demonstrate the coring rigs and radar equipment he and his students use to probe beneath the land and water surface, where alternating layers of sand, peat, and soil record past shifts in the configuration of beaches, dunes, marshes, and uplands. The research team hopes their demonstration will serve as proof-of-concept for a larger scale, holistic study of the entire Wallops Island region, which in addition to its aerospace facilities also includes two national wildlife refuges, a national seashore, several quaint seaside villages, and of course a herd of much-loved ponies. NASA has already invested more than $45 million to protect the island’s $1 billion in federal and state assets. The Wallops Flight Facility, established in 1945, now serves as NASA’s principal hub for sub-orbital programs, including the launch of sounding rockets, scientific balloons, and research aircraft. The Mid-Atlantic Regional Spaceport, established by Virginia in 1997, adds the capacity for orbital launches, including frequent re-supply trips to the International Space Station. The Commonwealth also recently added a runway for the launch of unmanned aircraft. 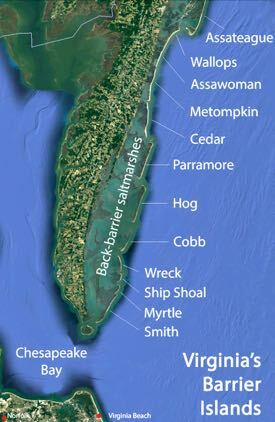 Wallops Island itself is part of an intricate and rapidly changing barrier-island system that includes Chincoteague and Assateague islands plus an array of inlets, bays, points, and coves. This system will continue to evolve as climate change and sea-level rise affect the region.